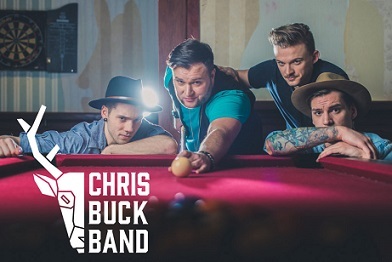 Meet the Chris Buck, country music band from British Columbia. They are one of the fastest rising country music artists in Canada, with a following of thousands of fans. Band members are: Chris Buck-Matt Genereux-Taylor Allum-Ryan Stead. In October 2018, they won Group of The Year at the BC Music Awards for their second released album, All In. The band burst on the Canadian Country charts in 2017 with their self-titled debut album, and their smash single, That's When You Know had more than 4 million streams and over 79.5k playlist adds on Spotify. They won a nomination for video of the year, 6 months of top 10 most wanted on Sirus XM, besides winning Album of the Year in 2018. The East Coast Music 2019 Awards in Charlottetown May 1-5/19 invited the band to Breakout West & ECMA's East Meets West to showcase their talents.They will perform in front of over 50 European delegates on the Breakout Stage reviewing their band for possible tours and perform as well on the Country Music Showcase. In 2014 the band with their debut album, Buck Wild, they won the Country Club Act of the year and in 2015 won the same award as well as the group of the year. The band just performed at Juno 2019 in London, Ontario to rave reviews. The group signed with Royalty Records/Sony Music Canada in 2017 with their debut album and featured 4 top 40 country radio hits and their Billboard top 20 radio smash, That's When You Know, with Kira Isabella. After ECMA week in Charlottetown, they will be performing in Fort MacMurray at Boomtown Casino, Rocking the West in Winfield., and Dauphin Country Music Festival. The band is on the rise, and for more information regarding the band and their music, go to their website, address posted above.